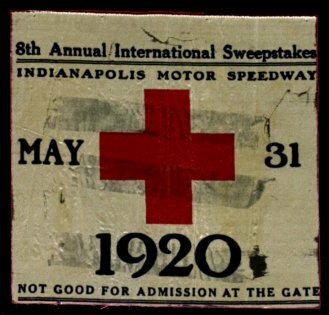 IMS medical armband were more than likely used at the first events* in 1909 as an ambulance can be seen in an August 21, 1909 auto race panoramic photo. Armbands were made of a silk/satin type material from 1909* through at least 1925. 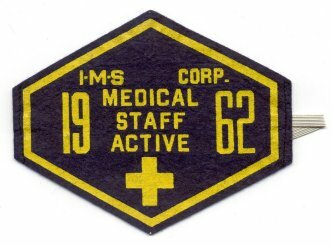 At some point after 1925 but prior to 1931, medical armbands changed from a silk/satin type to a felt type. Both of these types of armbands are prone to damage due to the general frailty of silk/satin and insects with felt. From 1933 through 1936* medical armbands switch to a cloth/canvas type of material which stands up much better over time than the silk/satin type and felt type materials used before. In 1937 a rayon type of material is used. The 1941 Hospital is made of the felt type so the transition back to the felt type occurred between 1938-1940. From 1965 through 1970, the material switches to more of a felt/cloth type then goes back to the felt type for 1971 through 1987. 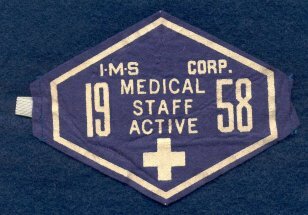 We need pictures of IMS Medical armbands for the years not shown and any other types of medical armbands from those years shown. If you have any, please email ni500cc@ni500cc.com a scan so it can be posted here on the site. Silk/satin type from 1913,1920-22 and 1925. 1931 and 1932 felt type. 1933 and 1936 cloth/canvas type and 1937 rayon type. 1964 felt type and 1965-1968 felt/cloth type. 1969-1970 felt/cloth type and 1971-1973 felt type. 1974-1987 felt medical armbands. Note that the event logo is used in 1982, dropped in 1983 and resumed in 1984. The 1985 and 1986 use the same event logo with only the date changed. Because of the fragile nature of felt and silk/satin armbands, many (especially those prior to World War II) did not survive making most of them very rare, very tough to find and very desirable. While the cloth/canvas type of the 1930’s do hold up better and felt armbands after World War II become easier to find, medical armbands were not as widely used as regular IMS armbands so in general they are tougher to find.